Help! My Alfredo Sauce Leftovers Don’t Reheat Well! Not that I know much about leftovers around my house anymore. But occasionally when we have a small amount of alfredo sauce leftovers, we’ve found that the butter separates when reheated, making for a greasy noodle on a plate. Have you ever run into this problem? Not to worry – I am here to solve the dilemma. We stir the leftover Alfredo Sauce into some marinara sauce. Have you ever had marinara mixed with alfredo? It’s incredibly delicious. It’s so delicious, in fact, that my boys sometimes request that I make this on purpose. This is fine because I always love preparing two separate sauces when I make pasta because I have nothing better to do than to double my efforts in the kitchen. But seriously, it’s worth making two sauces because the combination is so good. Or…we could simply make extra Alfredo Sauce on purpose one day to eat as Fettuchini Alfredo. Put the leftovers away, then make spaghetti with marinara sauce the following day. Put those leftovers away, and then on the third day we can stir all the leftovers together and have a Spaghetti Alfredo meal. Probably the day after that, we should make something besides pasta. You think? The two sauces together with pasta truly is delicious. If only all leftover issues could be solved by stirring them into something else to create a delightfully brand new dish. For the record, Homemade Alfredo Sauce with pasta is amazing and tastes even better than what you order at a restaurant. Talk about a money saver! Have you discovered any tricks for reheating Alfredo Sauce? I have found that the butter and the cheeses melt at different temperatures, which leads to them separating when cooling. I store my leftovers in a jar and then when I heat them up I just give it all a really good wisk when it is warm and all the cheese and butter is melted. It incorporates back together just fine! Even though I don’t have to hide the Alfredo in marinara, I will say that it is also our favorite way to eat pasta. We love having both sauces together! So yummy! I have heard the secret is to never let it come to a boil. Heat slowly over low heat and whisk. I feel like if you just serve the sauce and pasta separate then store it separate in the fridge there are no problems when you reheat the sauce alone. I wonder if the solids in the sauce cling to the starches in the pasta and then all that is left is the ghee making the pasta oily? I haven’t had an issue yet, I just don’t reheat all the way. I make sure it’s warm, but not hot. Since I’m usually boiling a pot of noodles, they are hot enough that when I pour the lukewarm sauce over the noodles, it ends up being warm enough. I have noticed a bit of separation, but it hasn’t bothered anyone in my family yet! Has anyone tried using the leftover Alfredo sauce on a pizza crust (if you are familiar with CiCi’s macaroni pizza, you know what I’m talking about…), topped with mozzarella? Interested to know if it worked, especially with the potential separation issue! Thanks! We like white pizza night. 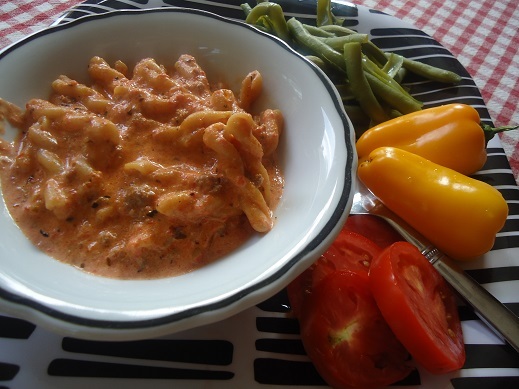 Use Alfredo sauce as is or stir in just enough red sauce so it no longer separates. Then top your pizza with ingredients that go well with the white sauce such as: cooked chicken strips, diced ham, cooked crisp asparagus , red onion or green onion, or something like spinach leaves, chopped garlic fresh tomato diced, fresh oregano or basil, etc. Don’t forget your cheeses: ricotta, mozzarella, fresh grated Parmesan, a little fontina, etc. it’s fun to experiment. Lisa is right. 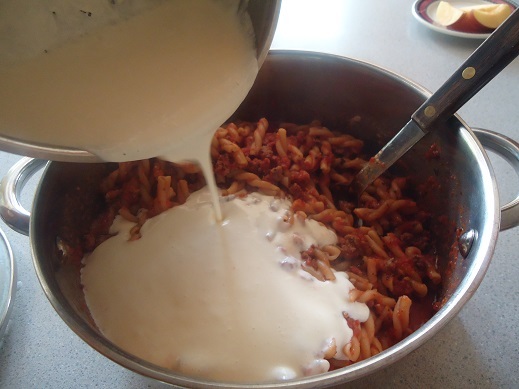 Reheat sauce separately on low heat and whisk continually; do not boil. I have made homemade Alfredo sauce for years. I don’t make two separate sauces. I just add heavy cream and lots of fresh Parmesan to my red sauce. Delicious. Marinara sauce freezes well, so when you make that, you could just freeze some of it to add to your next alfredo. I don’t have separation problems with leftovers, but I don’t keep the sauce separate. All of it goes into the pasta, then the leftover pasta goes in the fridge. Gets reheated in the microwave as lunch at work the next day. We do add a bit of extra romano cheese when reheating. I often save a bit of cooking water to mix in when reheating, find it helps. As for the pizza…we use home made pesto sauce on ours. Yum!!! We love your Alfredo sauce here! I store the leftover pasta in a bowl, barely covered by cold water. I learned this years ago from someone who worked in restaurants. When I reheat, I pull the pasta out with my fingers, and inevitably a little water comes along too. I then add the leftover Alfredo sauce to the pasta, and heat on medium low in a small saucepan. As long as I am nearby to stir it as is warms up, it is just as awesome as when I first made it. I have, on rare occasions, heated at too high of a temperature, or neglected to stir it often enough, and it has separated. So I agree with previous posters that stirring and lower heat are key to avoiding separation. 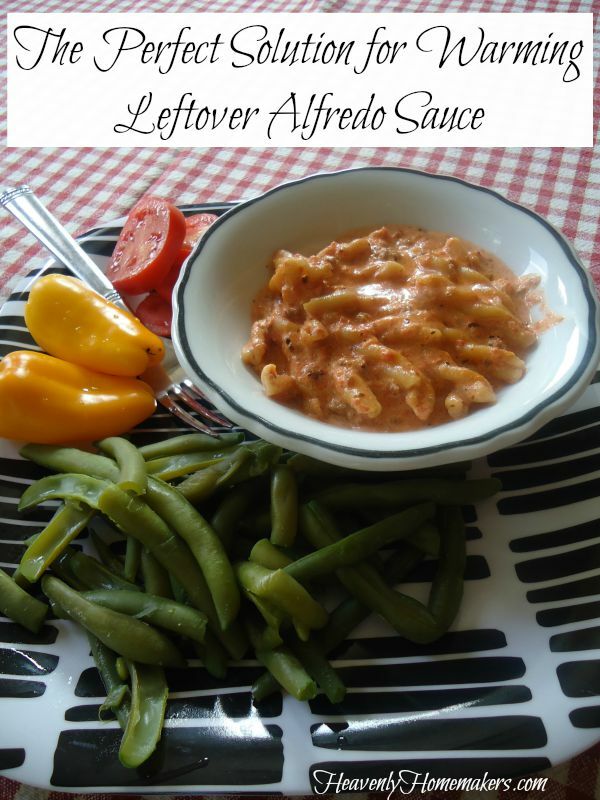 After reading this post, I must try it mixed with red sauce the next time I have leftovers! I store my sauce & pasta separately, and re-heat them separately. Even then, I find that the sauce (on low heat) separates with an oil “slick” floating around the edges of the pot. I read a tip that said to add a little heavy cream to help it blend back together. I did just that this last time and it worked like a charm – didn’t even need to add a lot. Like seriously, a splash. Give it a mix & it’s good to go. Perhaps this same concept can be used even when you store your pasta & sauce mixed…? Best of luck!